National West Zone Award of Indian Society of Soil Science, New Delhi for the year 1994 for best Ph.D. research in West Zone of India on “Potassium Fertility in relation to Soil Mineralogy of Some Important Vertisol soil Series of Maharashtra”. Award of Commonwealth Fellowship for Post Doctoral Research at U.K. from 1.9.1999 to 30.9.2000. The PDF work was on “Soil Mineralogy of Irrigation Induced Saline – Sodic Shrink Swell Soils of Maharashtra, India” . Awarded Teacher Fellowship under faculty improvement programme for Ph.D. course work at IARI, New Delhi. Awarded first prize for best poster presentation state level seminar of Rahuri chapter of Indian Society of Soil Science on “Soil quality for sustainable crop production” held at M.P.K.V., Rahuri 12th Jan 2004. First Best poster paper awarded in 7th Agril. Science congress held at AC, Pune Feb 16-18,2005. Awarded D. G. Kulkarni Best Krishi Lekhan Puraskar – First Prize from Baliraja publication for popular article. 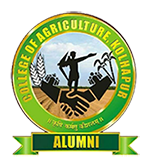 Awarded Senior Research Fellowship for Ph.D. by ICAR New Delhi. I st prize for research paper on “ Conjoint use of chemical fertilizers and organic manures for sugarcane “ at 50 th annual DSTA, Pune , 2002. I st prize for research paper on “ Sustainability of soil productivity in sugar based cropping system “ at 51 th annual DSTA, Pune, 2003.
awarded gold medal in M.Sc.(Agri.) SSAC in the year, 2011 by MPKV , Rahuri . Thus the faculties of this section also actively involved in other student activities assigned by Associate Dean viz., Rector, Monitor, NCC Officer, NSS Officer, SWO etc. for welfare of college students. Similarly enthrusted responsibilities of quality teaching, research and extension activities.